Even though Maria called it an "unaspirin baby hike" we did join the other tourists in an outing to the Levada do Caldeirão Verde. Madeiras water supply is rather unevenly spread. There is lots of rain on the north side of the Island and lots of sunshine on the south side. While the sun is not readily transportable, the islanders have setup a network of over 2000 kilometers of irrigation channels running from the northwest to the southeast. These channels transport large amounts of water and at the same time provide nice level hiking paths. 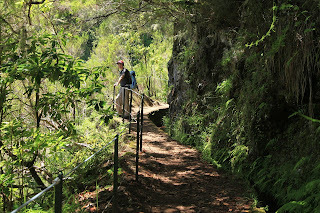 Levada hiking is one of the corner stones of Madeira tourism. Going with a group has its disadvantages, such as fellow hikers going on about Madeira being so pristine and non-touristic (what have they been smoking?) but also perks like our grumpy old guide who has only been to mainland Europe once during his military service. Using her uttermost in charm and tactfulness Regula got him to tell her interesting tidbits about island life like detailed instructions on how to prepare the traditional Christmas dinner of beef and potatoes but also about the dark sides of the EU money which has thrown the island economy into turmoil causing speculation to flourish and overblown projects being started and then abandoned midway as the money stream dried up. We even encountered some endemic plants today. Most striking to me was the dandelion tree. A veritable tree with flowers and leaves looking much like a dandelion. I am not sure if it is genetically close to our garden weed, but if it is, it should serve as a dire warning to people who let the little pests grow unopposed in their backyard. I'm a portuguese anthropologist and I'm doing my doctoral research about the levadas of madeira as its relationship with tourism. 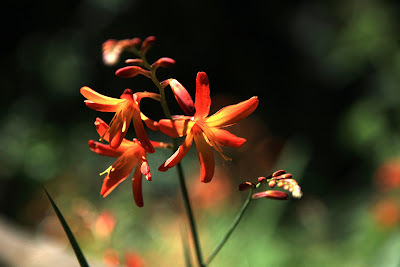 Can you please tell me more about your experience at levada do caldeirão verde. Did you walk/done other levadas? if yes, which?